On most weekends, the parks and stadiums of Buenos Aires are crowded with some of the most passionate round ball enthusiasts in the world. On Saturday afternoon however, puzzled locals at club DAOM, which is only a couple of drop punts from Maradona’s famous Boca neighborhood, witnessed the sight of a new Sherrin being bounced as play kicked off in South America’s historic first international fixture. Los Santos (Saints) from Chile and Las Aguilas (Eagles) from Argentina were playing for the inaugural 9-a-side Andes AFL Cup, although both clubs agreed beforehand that the promotion of “Futbol Australiano” in South America was more important than the result. After a tight and physical first quarter, Chile eventually got on top of their hosts and ran out comfortable winners 19.10 (124) to Argentina's 1.5 (11), largely due to the influence of their expatriate Australian forward line consisting of Pedr Chapman (9 goals) and Tristan Bradbrook (4 goals). Post match activities included a soccer challenge and a magnificent Argentinean BBQ where players and supporters from three countries mingled and enjoyed some traditional “Fernet and coke”, drunk from a seemingly bottomless bucket. Chilean football kicked off in April this year with the launch of Los Santos in the capital Santiago whereas the Argentineans were looking to re-establish the game in their capital after running a minor league format from 1998 to 2005. 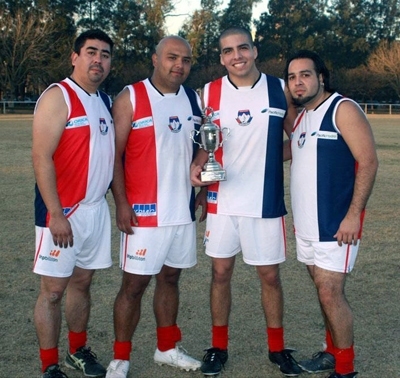 The Chileans were coached by Pablo Mejias who grew up in Australia and played some footy at the Port Adelaide Magpies. Pablo was one of four Chilean nationals in the touring squad of 18 that flew over the snow capped Andes for the historical fixture. The Eagles were coached by Ricardo Acuna who has been the mainstay of football in Argentina following his visit to Western Australia in the 90s where he spent time as a guest of the West Coast Eagles. The Andes Cup will now be contested in Buenos Aires and Santiago every year, with Argentina vowing to return the silverware to Buenos Aires on their upcoming visit to Chile.